Sled dogs are used in Canada, Lapland, Greenland, Siberia, Chukotka, Norway, Finland, and Alaska. A 2017 study showed that 9,000 years ago the domestic dog was present at what is now Zhokhov Island, arctic north-eastern Siberia, which at that time was connected to the mainland. The dogs were selectively bred as either sled dogs or hunting dogs, implying that a sled dog standard and a hunting dog standard co-existed. The optimal maximum size for a sled dog is 20–25 kg based on themo-regulation, and the ancient sled dogs were between 16–25 kg. 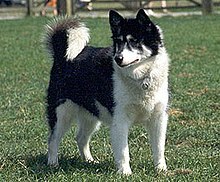 The same standard has been found in the remains of sled dogs from this region 2,000 years ago and in the modern Siberian husky breed standard. Other dogs were more massive at 30 kg and appear to be dogs that had been crossed with wolves and used for polar bear hunting. At death, the heads of the dogs had been carefully separated from their bodies by humans and is thought to be for ceremonial reasons. Roald Amundsen, whose Antarctic expedition was planned around 97 sled dogs. The first Arctic explorers were men with sled dogs. Due to the success of using sled dogs in the Arctic, it was thought they would be helpful in the Antarctic exploration as well, and many explorers made attempts to use them. Sled dogs were used until 1992, when they were banned from Antarctica by the Protocol on Environmental Protection to the Antarctic Treaty. Carsten Borchgrevink used sled dogs in Antarctica in 1898, but it was much colder than expected at Cape Adare. The dogs were used to working on snow, not on ice, in much milder temperatures. The dogs were also inadequately fed, and eventually all of the dogs died. 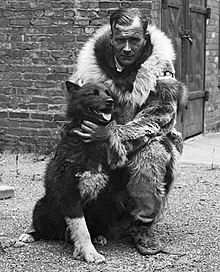 Erich von Drygalski used sled dogs in his 1901–1903 expedition, and fared much better because his dogs were used to the cold and he hired an experienced dog handler. His dogs were allowed to breed freely and many had to be shot because there was no room on the ship to take them home. Many that were not shot were left behind on the Kerguelen Islands. 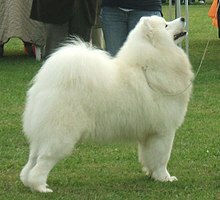 Robert Falcon Scott brought twenty Samoyeds with him. The dogs struggled under the conditions Scott placed them in, with four dogs pulling heavily loaded sleds through 45-centimetre-deep (18 in) snow with bleeding feet. Scott blamed their failure on rotten dried fish. Douglas Mawson and Xavier Mertz were part of the Far Eastern Party, a three-man sledging team with Lieutenant B.E.S. Ninnis, to survey King George V Land, Antarctica. On 14 December 1912 Ninnis fell through a snow-covered crevasse along with most of the party's rations, and was never seen again. Their meagre provisions forced them to eat their remaining dogs on their 315-mile (507 km) return journey. Their meat was tough, stringy and without a vestige of fat. Each animal yielded very little, and the major part was fed to the surviving dogs, which ate the meat, skin and bones until nothing remained. The men also ate the dog's brains and livers. Unfortunately eating the liver of sled dogs produces the condition hypervitaminosis A because canines have a much higher tolerance for vitamin A than humans do. Mertz suffered a quick deterioration. He developed stomach pains and became incapacitated and incoherent. On 7 January 1913, Mertz died. Mawson continued alone, eventually making it back to camp alive. 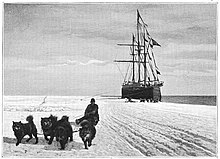 Roald Amundsen's expedition was planned around 97 sled dogs. On his first try, two of his dogs froze to death in the −56 °C (−69 °F) temperatures. He tried a second time and was successful. 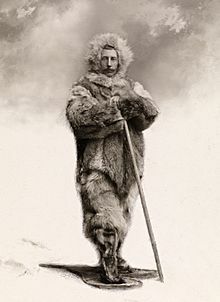 Amundsen was covering 27 kilometres (17 miles) a day, with stops every 4.8 kilometres (3 miles) to build a cairn to mark the trail. He had 55 dogs with him, which he culled until he had 14 left when he returned from the pole. On the return trip, a man skied ahead of the dogs and hid meat in the cairns to encourage them to run. There are two genetically distinct varieties of Alaskan Husky: a sprinting group and a long-distance group. 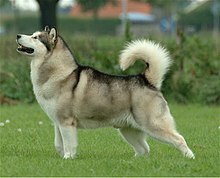 Alaskan Malamutes and Siberian Huskies contributed the most genetically to the long-distance group, while Pointers and Salukis contributed the most to the sprinting group. 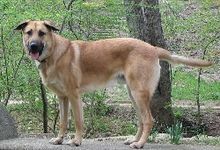 Anatolian Shepherd Dogs contributed a strong work ethic to both varieties. There are many Alaskan Huskies that are partially Greyhound, which improves their speed. Although some Alaskan Huskies are known to be part wolf, which increases their endurance,[unreliable source?] these wolfdogs are generally disliked since they have a reputation of being difficult to control. 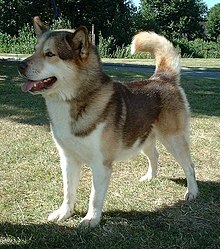 The Chinook is a drafting and sled dog developed in New Hampshire in the early 1900s, and is a blend of Mastiff, Greenland Husky, German Shepherd, and Belgian Shepherd. It is the state dog of New Hampshire and was recognized by the AKC as a Working breed in 2013. They are described as athletic and "hard bodied" with a "tireless gait". FSS held the first World Championships (WCh) in Saint Moritz, Switzerland in 1990 with classes in only Sled Sprint (10-Dog, 8-Dog, and 6-Dog) and Skidog Pulka for men and women. 113 competitors arrived in the starting chutes to mark the momentous occasion. At first World Championships were held each year, but after the 1995 events, it was decided to hold them every two years, which facilitated the bidding process and enabled the host organization more time for preparation. There are numerous stories of blind sled dogs that continue to run, either on their own or with assistance from other dogs on the team. My Dogs In The Northland (1902) by Egerton Ryerson Young focuses on Egerton's adventures with a team of twelve sled dogs. The Call of the Wild (1903) by Jack London is a famous work of fiction about sled dogs and their lives in the Gold Rush era; used Young's book as a source. ^ Pitulko, Vladimir V.; Kasparov, Aleksey K. (2017). "Archaeological dogs from the Early Holocene Zhokhov site in the Eastern Siberian Arctic". Journal of Archaeological Science: Reports. 13: 491. doi:10.1016/j.jasrep.2017.04.003. ^ Marquard-Petersen, Ulf (2011). "Invasion of eastern Greenland by the high arctic wolf Canis lupus arctos". Wildlife Biology. 17 (4): 383. doi:10.2981/11-032. Note: These figures are in the past because this was the time period of interest for the wolf research conducted. ^ a b c d Huson, Heather J; Parker, Heidi G; Runstadler, Jonathan; Ostrander, Elaine A (July 2010). "A genetic dissection of breed composition and performance enhancement in the Alaskan sled dog" (PDF). BMC Genetics. 11: 71. doi:10.1186/1471-2156-11-71. PMC 2920855. PMID 20649949. ^ a b c d e f g h i j k l Young, Ian (2002). 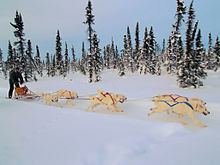 The Iditarod: Story of the Last Great Race. Illustrated by Timothy V. Rasinski. Capstone Classroom. pp. 5–13. ISBN 073689523X. ^ a b c d e f g h i "The Modern Sled Dog". Yukon Quest Sled Dogs. Yukon Quest. Archived from the original on December 26, 2013. Retrieved February 15, 2013. ^ "The Sledge Dogs of the North". Outing: Sport, Adventure, Travel, Fiction. W. B. Holland. 1901. pp. 130–137. Retrieved 4 March 2013. ^ a b c d e f g h i j k l m n o p q r s t u v w x y William J. Mills (2003). Exploring Polar Frontiers: A Historical Encyclopedia. ABC-CLIO. pp. 189–192. ISBN 978-1-57607-422-0. Retrieved 27 February 2013. ^ Douglas Mawson. "The Home of the Blizzard". ^ a b c Person, Stephen (2011). Sled Dogs: Powerful Miracle. Bearport Publishing. pp. 4–10. ISBN 1617721344. ^ a b c "AKC Recognizes Two New Breeds for 2013". Dog Channel. February 20, 2013. Retrieved 2013-04-11. ^ "History - International Federation of Sleddog Sports". www.sleddogsport.net. Retrieved 28 March 2018. ^ Young, Egerton Ryerson (1902). My Dogs In The Northland (eBook) (3 ed.). F.H. Revell Company. p. 9. Retrieved 16 May 2013. For years, with great dogs, I toiled and often with them was in great perils. Much of my work was accomplished by their aid. So I believe in dogs, and here in this book I have written of some of them and their deeds. 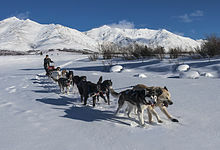 Wikimedia Commons has media related to Sled dogs.